The ’Barlang’ club located in the Dunaparti Culture Centre is an ideal place combining the jazzy feeling with a homely atmosphere. Throughout the club’s one and a half decade long carrier it has served as a second home for the band. Their growing audience seems to be enjoying their experimental shows, the premieres of the new tunes and the unforgottable jam sessions including their guest artists, who play a really important role at these events. 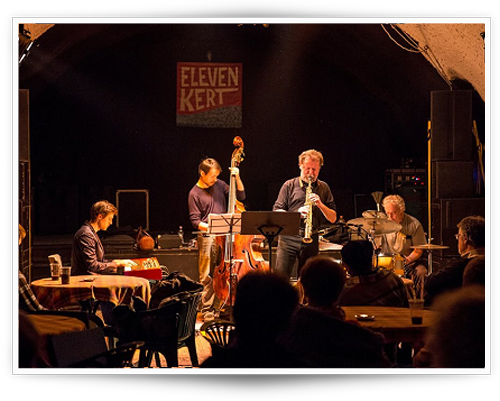 In the past few years they have had the privilige to welcome the creme of the hungarian jazz scene at their concerts, including up and coming musicians and well-known, cutting-edge artists. The series of concerts was supported by the National Cultural Fund of Hungary. Tickets are available right before the concert at jazz club.